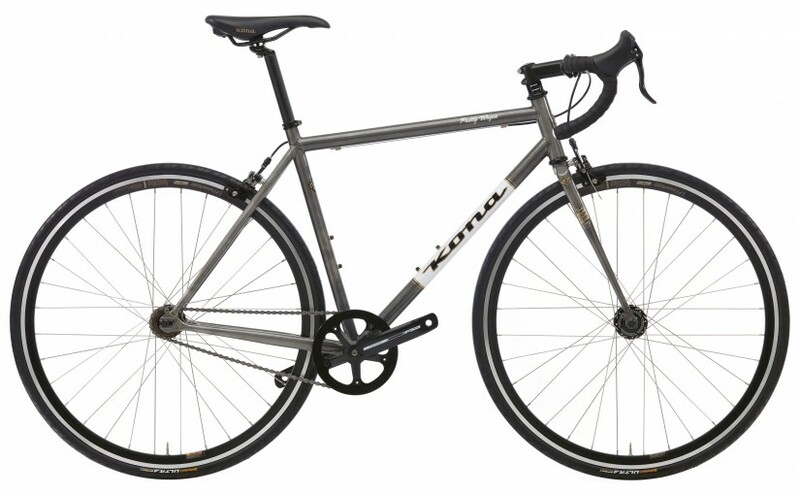 In January I replaced the cheap fixed gear bicycle I had since July – reasons behind this rather quick replacement might come in a later post – with a 2013 model of the Kona Paddy Wagon and I’ve been riding it pretty much every day since then. I already owned a Kona Coilair 2012 and I must say that I am still amazed by this horse’s reliability and quality so it was kind of a natural choice to go for the same brand. The bike is very decent the way it’s shipped but, not that the original parts were bad in any way, I changed a few things: the pedals (mounted my Crank Brothers Candy), the tires (I’ll ride Schwalbe CX Pro until the end of the winter) and the saddle (since my wife got me a brown Team Pro Chrome Brooks saddle for my 32nd birthday why should I sit on something else?). Nothing wrong to report so far – apart for the front wheel nuts that already began to rust (snow & salt must have something to do with that) – but I’ve had the bike for only a month. Long live the Paddy Wagon and if it proves to be as solid as the Coilair (and can keep up with at least 500 kilometers a month) I’ll probably still be riding it in a couple of years. Do you ride one? Are you pleased with it? If you have anything you want to share on Kona or on the Paddy Wagon don’t hesitate to leave a comment. Nice bikes. I am considering a Kony Honky Tonk (essentially a Paddy Wagon with gears). Not that many Stockholm shops that stock Kona. Fixmybike and Dropin bikes are two. Wanted to love the new Jake or Rove but the understated Honky Tonk is such a sweet, responsive ride. Less eye-catching for theives too. I agree with you, the Honky Tonk (FixMyBike’s owner rides one) is understated as much as the snake is bright orange. The Rove has disc brakes which might be a plus if you’re a year-round bike commuter. But as far as I’m concerned the Paddy Wagon has not disappointed me yet and I just love the simplicity of it. I have been riding a 2010 Paddywagon for about a year and really enjoy the responsive ride. I changed the stock Pista handlebars for some compact road bars and put a shorter stem on it to dial in a better fit. Other than that the bike is stock. It has a fairly upright stance with the longish head tube and steerer. I like the stock Conti Ultra Sport 28mm tires. I have been running them with tuffy tube liners and have had no flats. I mainly ride freewheel and have begun to notice some noise from the freewheel. Not ucommon for Dicta freewheels as I understand. The stock WTB saddle is comfortable enough but my typical ride on this bike is around 20 miles. I have other bikes in my stable for longer distance. I like the 42 by 16 gearing. I can climb some small hills and still get moving nicely on the flats. I love the Metallic Mint color of the 2010 model. It reminds me of Bianchi Celeste. When I saw this one on Craigs List a year ago I could not pass it up. It was in brand new condition and I got it for $250. This is my first Kona and I am impressed. When you’re riding Schwalbe CX Pro tires, are you still able to use decent fenders? Do you have fenders mounted, and if so, which could you recommend? If you could use 30C tires together with fenders this would really be a great option for commuting I guess. Are you still satisfied with your Paddy Wagon? I’m still loving the Paddy Wagon. Not a single thing to complain about so far. I could not fit fenders that would cover most of the wheels so I went for SKS Raceblade instead. They’re not as efficient as “proper mudguards” but they’re better than nothing. I can’t complain about the front fender but since the rear one doesn’t go all the way down the chain stays it can be wet and muddy around the bottom bracket.